Approximately five hours west of Florida’s Emerald Coast, the excitement is already building for New Orleans’ celebrated annual festival: Mardi Gras. Weeks of celebration will draw hundreds of thousands of people to the city for plenty of revelry that culminates in the main event on March 5th. The centuries-old celebration derives its name from the French words meaning Fat Tuesday—a religious holiday that takes place the day before Ash Wednesday and the beginning of Lent each year on the Christian calendar. To prepare for the traditional practice of fasting during Lent, people would “indulge their appetites”. Today, Mardi Gras is synonymous with colorful parades, feasting, imbibing and plenty of fun. 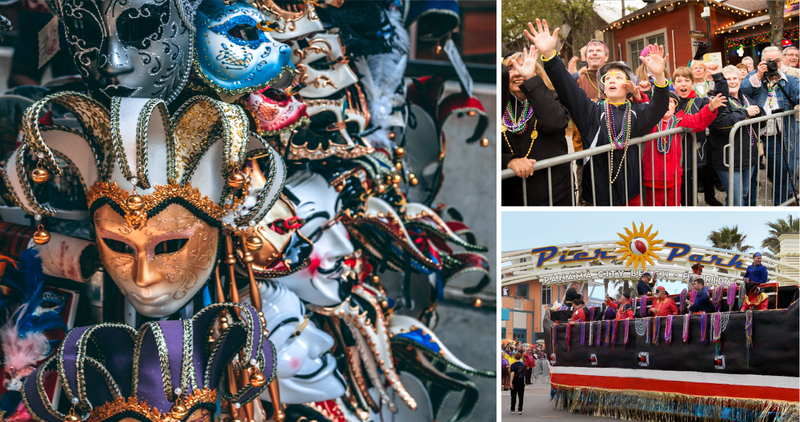 While New Orleans is the official U.S. capital of Mardi Gras, celebrations can be found throughout the Florida panhandle. In fact, many of the communities that the Premier Property Group calls home offer their own unique twist on the fun for adults and families alike. So, if New Orleans is not part of your plans the first week of March, make plans to let your hair down and get in on some beads and moon pies at one of these events in our backyard. The 17th annual Mardi Gras Fat Tuesday Baytowne Bash Parade will be held March 5th from 5-7 p.m. Along with colorful floats, golf carts and pick-up trucks, attendees will find plenty of parade marchers dressed up their Mardi Gras best. The post-parade celebration continues into the night with street performers, “throws” tossed from balconies on Main Street and parties at various community establishments. Those interested in celebrating Mardi Gras with their favorite furry friends can join the 16th Annual Mardi Gras Dog Parade on March 3rd from 2-4 p.m. This annual event features costumed canines and their humans throwing a myriad of beads and parade favors in themed convertibles, small floats, golf carts and bicycles. Registration required. PCB Mardi Gras and Music Festival March 1-2, Noon-8 p.m.
Panama City Beach’s famous Pier Park will host its own celebration in conjunction with the Krewe of Dominique Youx’s great Mardi Gras at the Beach parade. The festival will feature plenty of family-fun and entertainment. Destin Commons Mardi Gras Masquerade March 1, 6-8 p.m.
Destin Commons’ annual masquerade features a family-friendly environment with live music, face painting, a photo booth and parade. The Destin Harbor will come alive with dazzling floats and street performers on March 2nd at 2 p.m. for the annual Mardi Gras Parade. Following the parade, the main stage will feature the Cajun/zydeco music of Fais Do Do. The HarborWalk celebration continues March 5th with the Fat Tuesday Celebration and Pet Costume Contest complete with free red beans and rice and plenty of family-fun. Registration required. Pensacola Grand MardiGras Parade March 2, 2-6 p.m. The Pensacola Grand Mardi Gras Parade is annually the largest and most extravagant annual parade in the city featuring more than 6,000 human participants and often more than 100,000 attendees.